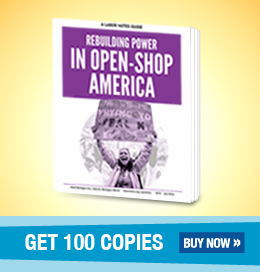 The open shop is the rule for private sector workers in 28 “right-to-work” states, for public sector workers in 25 states, and for federal workers all over this country. That means workers covered by a union contract get to enjoy the benefits of representation without being members or paying dues. For a short exercise to help your union start preparing to survive an open shop click here. The key is collective action, says Steelworkers Local 675 Secretary-Treasurer Dave Campbell. His union represents 4,000 workers in California and Nevada, many of them at oil refineries where workers get a window of opportunity to drop their membership each time the contract comes up for renegotiation. In each refinery of 300-600 workers, the union maintains around 90 percent membership. That's because members have the habit of acting for themselves as a union on the shop floor. Union leaders encourage members to bolster a grievance with workplace action. For instance, a supervisor had forbidden people to wear baseball caps, sunglasses, or Hawaiian shirts in the control room. Workers collected signatures on a petition and presented it to the other supervisor, who crumpled it up and threw it away. Involve workers in collective action, so they see what the union is about. Include non-members. Give each activist a list of nonmembers. Get them to ask their co-workers to join. Contract time offers another chance for action. During a rolling national strike over safety in 2015, an explosion at a not-yet-struck refinery in Torrance, California, injured several Local 675 members and blanketed nearby homes with potentially toxic dust. The union organized a caravan to ExxonMobil’s headquarters, where members in hazmat suits emptied a dump truck of horse manure at the company’s front door and held a sit-in. Later in the strike, members sat in at a city hall to demand that the city crack down on the illegal housing of scabs; they managed to get inside a Western States Petroleum Association meeting and drop a banner; and they launched a fleet of picketers into Los Angeles Harbor by kayak, so maritime unions would know to honor their picket line at a dock. After Homeland Security and the Coast Guard ordered the kayakers to stay 1,000 feet away, the union hired the Illuminator group from Occupy Wall Street to project picket lines onto the facility in lights. A version of this article appeared in Labor Notes # 458, May 2017. Don't miss an issue, subscribe today.